My Point at my Screen! myPoint Pro combines six tools in one: Crosshair, Grille, Coordinates, Mouse Locator, Mouse Halo and Heavy Shade. All tools are customizable: hotkeys, color, opacity, size, thickness, offset. myPoint will show its information above all other windows and applications, even when another application is active or in full screen. ★ Crosshair displays two thin lines across the mouse position. Visible on all monitors or only on the monitor with mouse pointer. Customizable performance, gauge, color, transparency, center, offset from mouse. Hotkey to toggle the tool. ★ Grille displays grille by horizontal and vertical lines. Visible on all or mouse monitor. Two modes: Follow mouse and Pin. Customizable gauge, aperture, color, transparency, offset from mouse. Hotkeys to change aperture size. Hotkey to construct the grille from specified bands number, aka Rule of Thirds. 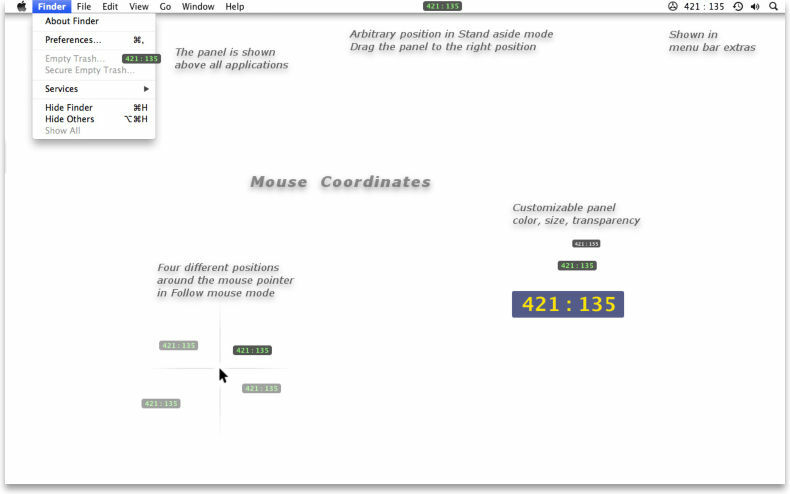 ★ Coordinates display information about current mouse position in menu bar extras and in a flying panel. Five origin points to calculate cursor position: left top, left bottom, right bottom, right top and custom. Set custom origin by hotkey. Move mouse cursor to origin point by hotkey. Input panel to set precisely mouse position. Coordinates ruler: measure the size while dragging with mouse. Copy current coordinates to clipboard. Show coordinates in X : Y or Y : X format. Customizable colors, size, transparency, behavior. Hotkeys to toggle and handle the tool. 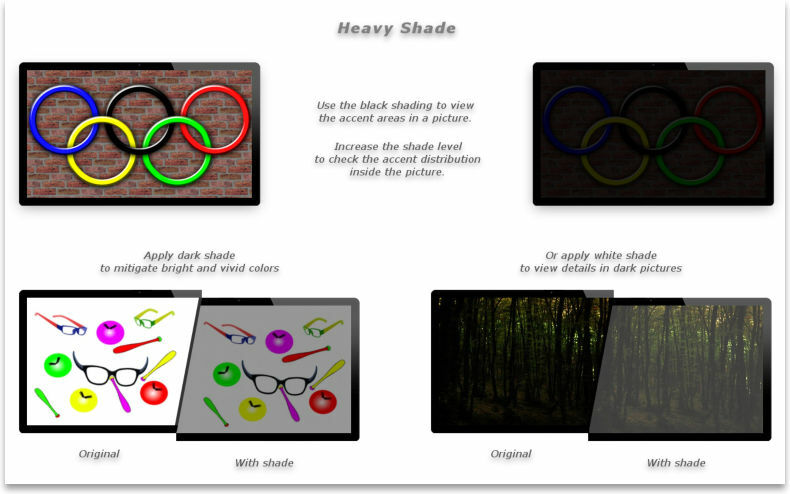 ★ Heavy Shade allows you to adjust the brightness of your monitors. The tool doesn't fiddle with display settings - it places translucent layers on top of desktop and other applications. 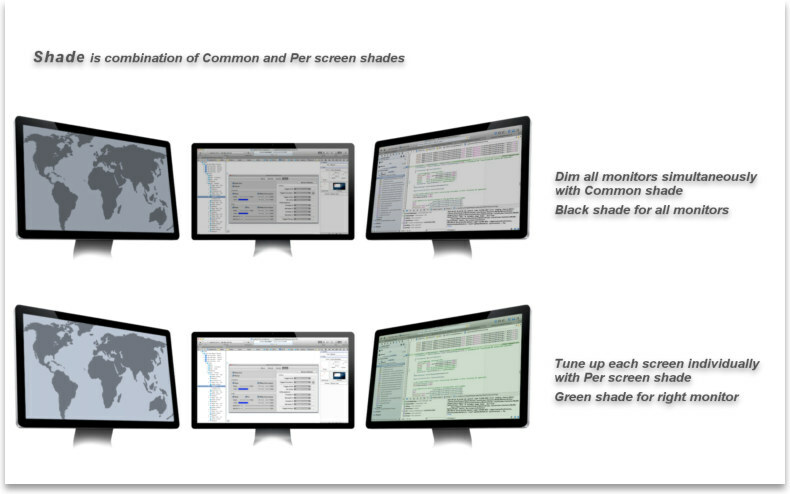 Dim all monitors with common shade. Additional per screen shade for up to eight monitors. Not limited shade level: up to 100%. Safety timeout: total shading above 90% is treated as heavy and will be decreased after the timeout elapsed. Change the shade level without leaving the active application - via hotkeys or from a menu in menu bar extras. Dim other screens at 100% black except the mouse screen. Eye care: the shade will fade in and fade out in a specified timeout. Shade assistant will track active applications and will toggle the shade automatically depending on user preferences. ★ Mouse Locator reveals the mouse position with a gently animated or static ring. Mouse movement after a period of inactivity. The module can be disabled. ★ Mouse Halo is an image permanently shown around the mouse cursor. 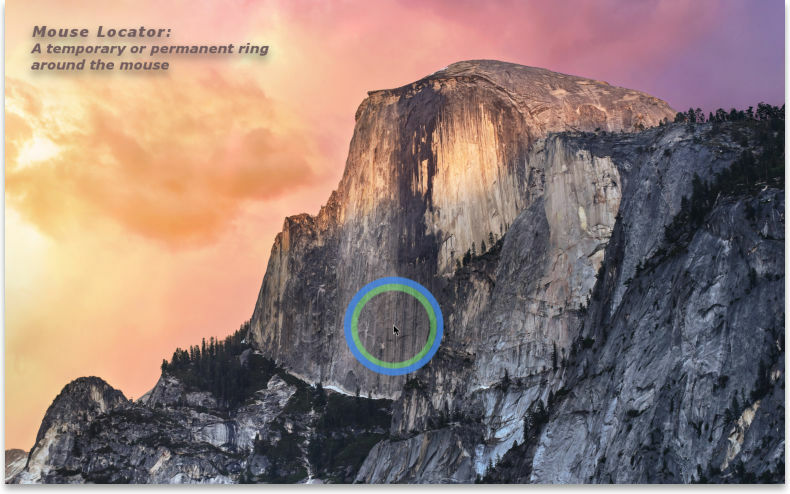 The classic halo is a ring surrounding the cursor, but the image can be positioned aside of the cursor. The user can use any image to create its own halos. A free online halo gallery is accessible from myPoint panel - an easy way to import new halos. Hotkey to toggle current halo. Hotkey to show next halo from a predefined halo set. Flip, shrink or cut the image. Organize preferred halos in so called halo set. Tools are visible on all monitors and in full screen. Customizable hotkeys to handle tools. Hotkey to show or hide application menu in menu bar extras. Can start automatically at user login. Common myPoint panel for all settings. Supports multiple users, screens and desktops. myPoint can be disabled - the easiest way to stop all tools and free their computing resources. Built on Apple's security paradigm sandboxing - reducing the threat of rogue code and malicious software. When myPoint is running, no icon is shown in the Dock. The basic control is through a menu in menu bar extras. myPoint neither changes the shape and color of mouse pointer nor hides it. Ability to disable the locator automatically on single screen computers. Show mouse locator on mouse click or mouse drag. Advanced mouse tracking to fix experience with 3rd party software like Remote Mouse apps. Fixes in mouse tracking, app menu and preferences panel, initial grid position, flying panel positioning. Improved Shade assistant: predefined or autocomplete applications list. Ability to enable or disable on screen messages about shade hotkeys. Ability to open myPoint panel at mouse screen. myPoint icon (in menu bar extras) respects app enabled state. “Restore defaults” buttons preserve hotkey values. The shade assistant respects “Dim others” mode. New shade feature: dim other screens at 100%. Per screen shade for up to eight monitors. Fixed shade behavior after adding new monitor. Reduce memory usage in crosshair and grille modules. New features in crosshair module. New features in grille module. Shade assistant is disabled by default. 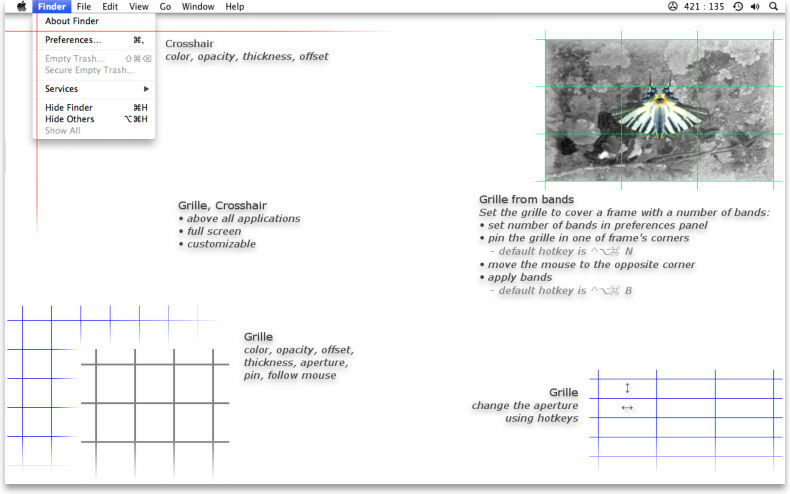 Fixed crosshair and grille on OS X 10.9 with multi-monitors. Fixed shade on OS X Mavericks with multi-monitors. It will track active applications and will toggle the shade automatically depending on user preferences. The shade will fade in and fade out in a specified timeout. Activate when mouse is crossing between screens. Activate on mouse move after a period of inactivity. Hotkey to toggle halo visibility. Select preferred halos in so called halo set. Hotkey to show next halo from the predefined halo set.